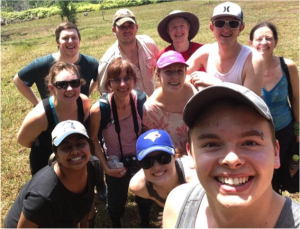 In February 2016, 13 undergraduate students and faculty members from the University of Alberta’s Augustana Campus in Camrose traveled from snowy Canadian winter, to the Osa Peninsula as part of a year-long tropical ecology and conservation course. 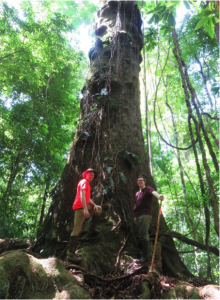 This trip was the culmination of five months of preparation that included learning about neotropical biota, developing our field research proposals, and organizing trip logistics. For most of us the dream of an adventure to Costa Rica was many years in the making, and for all of us it became a trip of a lifetime. After a day-long drive from San Jose, we experienced a world unlike anything we had previously known upon our late afternoon arrival at Piro. Following a delicious first supper, we donned our headlamps and entered the forest guided by our curiosity and the long anticipated first-hand view of the ecology that we had thus far only learned about in the classroom. We walked from leaf to leaf in utter amazement at all we saw, including spiders, scorpions, and insects. With our first sighting of a katydid we were confident that our project inventorying these insects would be a success. The sounds of the Osa peninsula were equally stunning. Between the restless bird and insect calls, we could barely hear ourselves think. However, once these calls subsided, we were made aware of a much more powerful sound; the ocean in the distance ceaselessly crashing upon the shore had us looking to the skies in fear of thunder showers that never came. As a welcome to Piro, on our first night we witnessed a katydid molt right before our eyes. Even more impressive were the sounds experienced during our first early dawn where the ocean’s booming waves created a remarkable backdrop for the chorus of howler monkeys whose calls could easily be mistaken as some terrifying creatures of the night. These sounds only added to the mystery of the Osa. 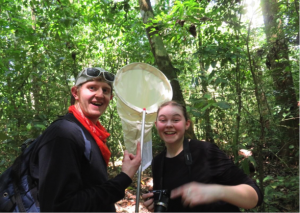 The katydid research team (aka katydids) , Samuel (left) and Emily (right) were excited to find many different species of katydid on the Piro trails. Our first full day was incredible. Between our early morning beach walk and our fun around the research station, we had already seen three of the four monkey species (spider, squirrel, and capuchin), many hermit crabs, pelicans, and hatched turtle eggs. As if our introductory day was not good enough, we ate the freshest fruit and had the coolest showers, which quickly became staples of the trip. The bat research team excited to catch and release their first bats. From left to right: Evan, Jonathan, and Kieryn. While our trip to Costa Rica promised to be an adventure, we could not forget about the research projects that we had spent so much time developing prior to our arrival at Piro. We were grouped into four research teams. 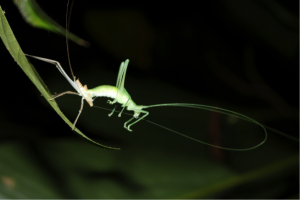 The katydid team set out to create the first katydid inventory on the Osa Peninsula. The bat team focused on evaluating the local abundance of leaf-nosed bats in comparison to broader neotropical trends. The understory vegetation group investigated the relationships between plant diversity and environmental factors (e.g., canopy cover, soil moisture). The forest structure team evaluated habitat characteristics (percentage of understory density and canopy cover) and their relationships to old growth, secondary, and gallery type forests. Up to this point in our university studies, we had not anticipated the unpredictable and adaptive nature of research that we experienced at Piro. 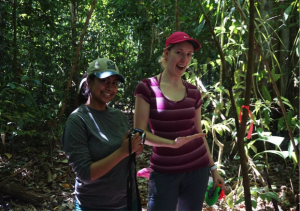 The vegetation group, Jaynita (left) and Carly (right), posing next to one of their first survey plots. While we progressed further into our research, we were surprised by how busy the days became with three to four simultaneous project activities; there was little time to rest between activities. One of the benefits to being in such a large and tight-knit group was the many helping hands. Our tailgate meetings every morning allowed us to identify the course of action for each day. Hard work and enthusiasm to share in each other’s research were important characteristics of our time spent at the station. Despite the rapid pace of our sampling, we continued to make time to appreciate the Osa Peninsula’s beautiful sights, sounds, and smells throughout our trip. Early morning starts allowed us to look for sea turtles with our volunteer hosts. The beaches at pre-dawn were beautiful, and these treks gave us the opportunity to feel the soft sand on our toes, see some falling stars, and even experience a small earthquake first hand while others were still sleeping. Through our early morning hike on the discovery trail, we encountered a diversity of wildlife including cheeky monkeys and a quickly fleeing curassow who, like us, must have been in a hurry to get to breakfast. We also enjoyed our guided tour of the Osa Verde farm with Beatriz. Coming from rural Alberta, it was incredible for us to see the amazing diversity of agricultural plant life and sustainable practices, in contrast to large scale monoculture farming. This experience was enhanced by Lassie (the lovely farm dog) and Hermes’ hospitality in providing us a snack of freshly cut coconut. The habitat characteristics research group, Shane (left) and Tye (right) taking a break from their survey and admiring the mighty ajo tree. There were times when we could not help but feel a spiritual connection to the land. We felt the age and experience of the large ajo trees and the vulnerability yet surety of the newly hatched turtle that we guided to the ocean. In doing so, we were constantly reminded of our place within the universe. Being present within every waking moment, and actively engaged with the natural environment rather than a passive bystander was a much needed change from our hectic lives back home. During our final day at Osa we hiked up (both ways) to the Greg Gund Conservation Center. We were amazed to see how quickly the forest is regenerating from its past use as pastoral land and teak stands. Our journey also highlighted what a fantastic group we had. On the hike, as on any other day, we always managed to laugh (editor’s note: this may not be helpful when trying to spot elusive wildlife) despite being hot, sweaty, and smelly. We even had enough steam to play a game of bocce ball at the peak! Although the trek was long and the heat was intense, it was worth every moment just to see, from a new perspective, the whole preserve where we had been studying and learning. With the view from Greg Gund Conservation Center, we understood the magic of the Osa, and its conservation value. We also appreciated how our research project contributions may also contribute towards the goal of conserving the Osa Peninsula. We are grateful to the OC staff for sharing their knowledge, time, and their generous hospitality. See you next time Piro! One big happy group at the top of the Greg Gund research station. What are BCATs? Why is their conservation absolutely critical? 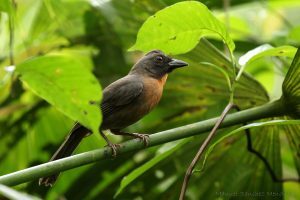 Black-cheeked Ant-Tanagers (Habia atrimaxillaris) may not be most glamorous bird on the Osa Peninsula. They lack the striking colors of a Scarlet Macaw, or Fiery-billed Araçari, and are mostly dull black, with just a splash of salmon in the throat and breast. Their vocalizations won’t send a chill down your spine like the eerie pan flute-like songs of a Common Potoo, and consist instead of a slurred two or three note whistle of a song. However, these superficially lackluster attributes belie a truly fascinating species, and one that is important to conservation on the Osa Peninsula. Black-cheeked Ant-Tanagers, or BCAT, to use the four-letter bird banding code and save a little breath, belong to the genius Habia. This genus of birds’ common name, Ant-Tanagers, comes from their behavior of joining the mixed flocks of birds that follow swarms of army ants in order to catch the insects and other small invertebrates that attempt to escape the relentless predatory ants. Some other members of Habia are obligate ant followers, which means following ant swarms is their main strategy for finding food. BCATs will follow ant swarms if they are present, but that strategy is not their primary source of food, so they are classified as opportunistic ant followers. They mostly feed by foraging at the lower levels of the understory of primary and well-established secondary forests. Intently cocking their heads while searching, sometimes comically falling about on broad palm leaves, and snatching up the insects, spiders or even small lizards that they find. BCATs also occasionally eat the fruits of some understory plants. They usually live in small family groups, consisting of a breeding pair, and often at least one of the offspring of the previous year’s successful brood. They keep in contact with frequent noisy chatter, and when they are nesting, it seems everyone chips in to help feed the new hatchlings. Perhaps most importantly, BCATs are endemic to the Osa Peninsula and the lowlands along the coast of the Golfo Dulce. 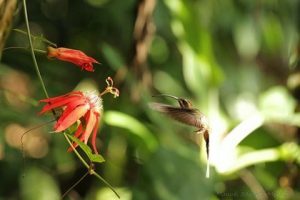 “Endemic” means they cannot be found anywhere else in the world, or even elsewhere in Costa Rica. Their very limited range, and shrinking habitat have led them to be listed as Endangered by the IUCN. Any threat to the region is a threat to the health, and even the survival of the entire species. As with many tropical bird species, little research has been done on BCATs, and there is much that we don’t know about them. I came to Piro Research Station and Finca Osa Verde in an attempt to assess the density of the BCAT population here, and to gain some insight as to their habitat preferences. This involves repeatedly visiting randomly chosen points in different forest types, and counting the BCATs I can detect by sight or sound during a ten-minute period. I also carefully estimate the distance at which I first detect them with the aid of a laser rangefinder. I am still early in this process, but with enough data, and careful analysis, I hope to add to our understanding of this species’ health, and any threats there may be to its stability. The wonderful people and scientific resources here, as well as the pristine old-growth forest, long-standing secondary forest, and even the sustainable farm and reclaimed pastureland that are protected by Osa Conservation are essential to my study, and many others like it. I hope that my work can be a small part of the critical efforts being made at Osa Conservation to better understand and preserve this uniquely beautiful, and remarkably biologically diverse corner of the planet.